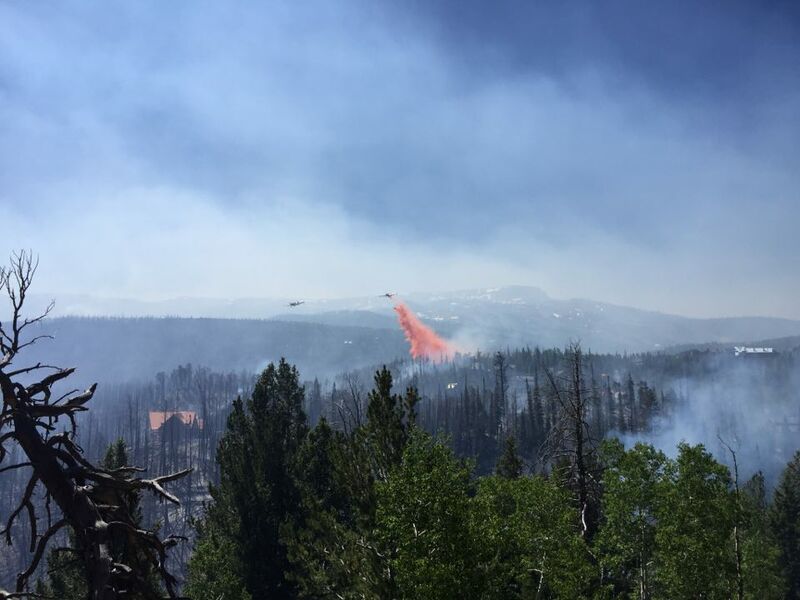 CEDAR CITY — With the Brian Head fire now close to 11,000 acres and more evacuations possible today, authorities are calling this the largest fire currently burning in the state. Officials report that the fire made an 8-mile run Wednesday, more than doubling its size to 10,950 acres and prompting evacuations in Garfield County at Horse Valley, Clear Creek and Beaver Dam. Brian Head Town remains under evacuation orders. Iron County Sheriff Mark Gower said more evacuations are planned today in Iron County in the Red Creek area. Authorities also plan to close the road from Paragonah to Bear Valley. A cool front has arrived in the area, bringing a shift in winds. Thursday morning, winds were 5-10 mph from the west and are expected to shift to the northwest this afternoon. Depending on the weather and associated winds, the fire could push toward Panguitch Lake. Another red flag warning has been issued for the day. While briefing crews this morning, Incident Commander Tim Roide stressed the extreme fire was “unprecedented.” Roide reminded the new personnel that public firefighting safety remained the top priority. “Rumors are literally like wildfires the spread out of control, and it only makes things more difficult for us because then we’re having to deal with people scared and worried that they’re going to be kicked out of their homes,” Gower said. Currently, the evacuation is in Parowan Canyon from milepost 7 to Brian Head. Evacuations are all handled through the incident command center with local authorities responsible for notifying the public and press about any evacuations planned, Gower added. Current evacuations – Last night evacuations were enacted for Horse Valley, Beaver Dam and Clear Creek. The town of Brian Head remains under evacuation. Contact the Red Cross for shelter information. Iron County in-breeds have been warned about this for 12 years that I know of. “Cut down all the dead tree’s up there! !” was the general consensus. The whole mountain range is nothin’ but a stack of firewood!! And now…..here ya go!! I have watched for many years now in dismay, the bark beetle slowly turn this gorgeous land into a dead tinderbox ready to ignite and burn to the ground. It is utterly disgusting that special interest groups such as SUWA prevent our forest service from the proper management techniques to take care of the land the way it should be; from exterminating the beetle in the first place, to preventing any removal of dead trees. Now look at what is left. They are just as much to blame for this as the person/s who started it all. We are supposed to be good stewards of this land but we are FAILIING at it miserably! I look at the way the thinning is taking place now in places such as Lars Fork, Stawberry Valley and Everett Hollow and I’m puzzled at the near “clear cutting” techniques that are being used in these areas…but NOTHING could have been done like this to prevent this kind of catastrophe in the highest elevations where the bark beetle was so prominant?? Something is amiss…really really amiss..
SUWA should be held responsible. Their radical leftist agenda helps nothing. How do they get the power to stop proper forest management? The Forest Service should have told them to pound sand when they sued to stop the clearing of the dead wood. The question is; “What needs to happen in able to invoke some change?” When I was growing up we hunted to the north of SR14 closer to the Duck Creek area where it seemed like there was some “Common Sense” approach to the methods used for thinning and taking care of the forest. You look over in the duck creek sinks area and down around Asay Knoll and the trees and the forest look “Healthy”. WHY were these methods changed?? Look now at the new areas around Strawberry and Swains creek and huge machines are literally tearing everything to pieces in all directions. You can probably see for 5 miles through some of the areas because the trees are so extremely thin. It seems like we can’t do anything without straying from one extreme to the other. If there could be any sort of “Moderation” to all of this mess, we could probably end up with something that works better for everyone, but with all of the politics nowadays, we just cannot seem to find a happy medium. So there’s the do nothing approach from the “libruls” and then there’s the total destruction clear cutting strategies by the “conservatives”. There’s a lot more money to be made in clear cutting than in selective cutting. Right wing loons always think all evils in the world are done by “libruls”, but the reality is they’re just simple-minded nutters and loons. Another factor is that the winters aren’t cold enough anymore to kill off pests like bark beetles because of climate warming. Right wing nutters and loons like UtahPatriot think all these problems will be solved by burning more coal.